As mentioned above, the origins of the house, as with so many medium- to- small old country houses all over the county, is well wrapped in the mists of time. A certain amount of speculation may be permitted however. 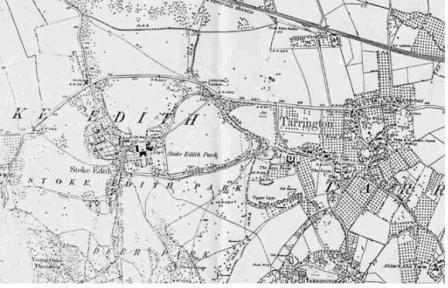 For what follows, the reader might like to refer to Map 1, taken from the 1886 Ordnance Survey, which provides a general view of Tarrington and Stoke Edith before the changes of the 20th century. As is well known, Tarrington appears (under the name of Tatintune) in the Domesday survey of 1086. The Anglo-Saxon suffix “-ton” is normally thought to refer to a farm or manor and presumably the village grew round such a farm or manor in the late Anglo- Saxon period. Prebendary T.H. Parker, in his interesting little leaflet “Notes upon the Parishes of Tarrington and Stoke Edith” (hereafter “Notes”) speculates that the manor, at the time of Domesday, may have been at Alder’s End. However, it would be unusual for the manor to be so far from the Parish Church and main road (as to which, see below) and the old house, now demolished, known as Soller’s Court, roughly where Willowsend now stands, has also (perhaps more plausibly) been suggested as a possibility. It is likely that the Parish Church of St. Philip and St. James (though its earliest existing fabric seems to be 12th century) is on the site of an Anglo-Saxon predecessor and it’s well established that the original main road through the village took the course of the present School Lane, passing just to the south of the Church. As we will see below, this was certainly the main road through the village (and indeed the main Hereford-Ledbury-Gloucester road) up till the late 18th century, when the road was moved to its present A438 alignment. Traces of medieval cottage foundations have been found in the field between Columbine Cottage and Orchard End and it is thought likely that similar traces exist under the houses on the other, North, side of the Lane and indeed in the old and new Rectory gardens beyond. Tarrington Court (called “The Farm” on Map 1), a house with clearly ancient origins (Map 1 mentions “Moat, rems of” there), sits back about 50 yards South of the Lane and about 100 yards West of the cross-roads where School Lane meets the road to the site of Soller’s Court and Alder’s End. We may imagine then the original village to be centred round these cross- roads and that both sides of School Lane, running both East and West from the cross-roads, were fairly continously built-up. Indeed the village may well, from late Saxon times to the early 14th century, have been more populous than at the present day. The Vine sits immediately on this old main road, about 150 yards to the West of the cross-roads and 300 yards to the West of the Church. Although the land to the South of it, the other side of the Lane, slopes up towards Tarrington Common, the site of the house itself is on a well-drained plateau, from which the land to the East, West and North gradually declines. The water supply is good – to this day the house has its own well. It is sunk in the floor of what is now the Hall, stone-lined and approx. 17 ft 6 in deep. The water at the bottom is clear. Judging by the position of the house and its amenities, there seems every possibility that a dwelling of some sort was here or hereabouts from practically the earliest settlement of the village. A prime site as this, surrounded as it is by good farming land, is unlikely to have been unoccupied for long. Whether or not there was any earlier settlement on the site, it seems likely that there was a dwelling here by at least the end of the 15th century. When the house was being renovated in 1998-9, the builders Dimbelow Crump, who specialise in restoring historic properties, dated the oldest beams in the house to c 1450 – 1500. These are the beams in the ground floor and first floor rooms in the NW corner of the house – close to the well. Dimbelows thought these rooms represented the earliest existing part of the house, being a fairly simple yeoman’s dwelling of one or two rooms below and one or two above, with adjoining farm-yard where the existing Hall and well now are. Of course, this cannot be proved – and it is possible that the 15th century timbers were re-used from another site at a later period – but Dimbelows’ reconstruction is plausible. Most simple (and even not so simple) houses of this date in this part of the country were of the familiar “black and white” timber and wattle/daub construction (though of course the timber would not in fact have been black but its natural colour) and this may have been the first fabric of The Vine. However, the NW corner of the house uniquely shows traces of ancient stone work (the rest of the house facing is brick from a later period) and thus the possibility exists that, at least from an early date if not initially, the house was in stone.